Whether you raise goats for meat or dairy, breeding is something that needs to be considered when mapping out your setup. If you plan to raise dairy goats, you will need to breed those goats in order to ensure you have a constant supply of milk. This means you either need to raise bucks for breeding or find a buck elsewhere you can rent. 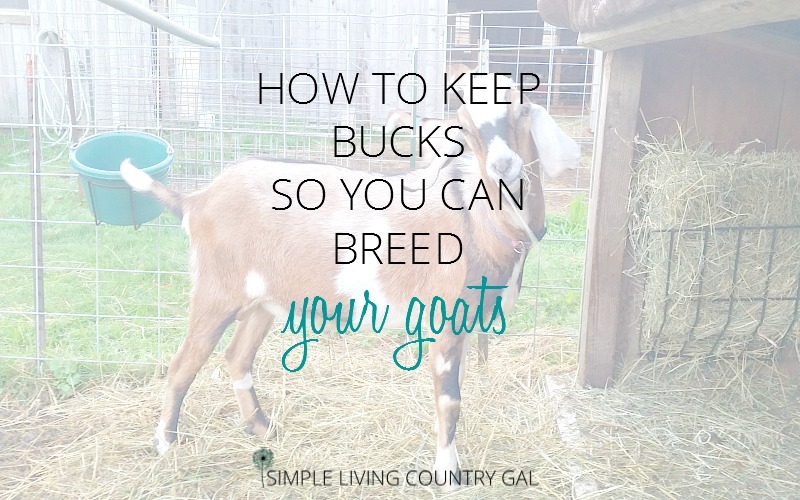 If you choose to raise bucks then housing bucks for breeding goats is something you will want to look into. For us, we learned early on that keeping a buck (or 5 if you have letting go issues) was the best way. This meant we could breed on our own schedule which is important if you are older (ahem like I am) and you are raising goats with little help. Let me just say that having 5 goats all due the same week is not the way to go. Staggering births will keep you sane and your goats sane as well. One thing I did not know (and oh boy I wish I did) was the nature of a buck, especially one that is in rut. I planned on housing our buck inside of the barn with the rest of my little herd. I soon found out that when a buck is in rut they transform into, well something else entirely. You can read more on Buck Rut here. They smell. Oh boy, do they smell! When a buck is in rut he will “spray” himself (meaning he will spray urine on his face, front legs, and beard). This odor is what the ladies love and will more often than not put a female goat into heat if she is around it enough. The bad news is, if this smell is anywhere near your barn it will make everything in that barn smell as well. Including you, your milk if you have a milking stall in your barn like I do, your hay and anything else that is the least bit porous. Goat bucks in rut can get a bit crazy. I have never had a truly crazy buck (knock on wood) but I have heard some stories. If a determined buck wants to get to a doe in heat, he will get to that doe in heat no matter what you have set up. Housing bucks in a barn with your does will only make your bucks crazy wanting to get to the does no matter what the cost. Now, that doesn’t mean it can’t be done. I just find it very difficult and for that reason, we keep our bucks outside in a lean to shelter. They will stop eating if distracted. Bucks can get pretty obsessed with does in heat. So much so that they will completely stop eating and just pace and look for a way to get to the does. For this reason, it is important to “know” your goats. This will help you to see quickly when something is off or just not right. Goat bucks in rut can be loud. If you have a frustrated buck they will yell to let you (and your neighbors) know it. Not all bucks are loud, but we raise Nubians and they are known for their vocalness. To help we just give our neighbors a heads up that things might get a bit noisy and they are fine with that. Now, I am not telling you all of this to deter you from raising your own bucks for goat breeding, but I do want you to go into this with your eyes wide open. These are all things I had to learn the hard way. Knowing then what I know now would have saved me so many headaches. So, what is your plan B? House your bucks outside and away from your does. For us, we use a lean-to that is located out back of our barn. It did not start here, but over the years I have learned what works best and for us, this works best. Our buck shelter is far enough away that he is not distracted by the herd, yet close enough that he can see the other goats. Let me just stop here and say that goats are highly social animals, even stinky bucks. It is best to have a wether (a male goat that has been “fixed” or castrated) in with your bucks. Make sure your wether is a tough goat since they can end up being the target of a buck that is in rut. Our big buck is his pen alone but as long as he can at least see the other goats he is fine. You will have to learn the mannerism of your buck and adjust accordingly. Lucky for us our buck is not loud, however, I still let my neighbors know that breeding season is coming up and things may get a bit noisy over at our place. Even though our neighbors are not close, this just helps to keep things friendly between us. Can bucks be out all winter? Yes, they can, however, and I cannot stress this enough, if you live in a colder climate do not pamper your goats. You will only pay for it in the end. 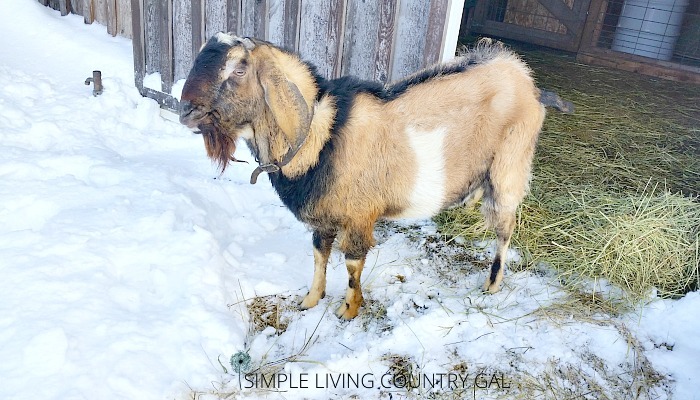 A goat is fully capable of growing a lovely thick winter coat that will keep them warm and dry in winter weather. However, you must ALLOW that winter coat to grow and thicken. I have purchased goats that were raised in heated barns and their constitution is weak at best. They simply do not have the stamina to make it through a cold winter without help. 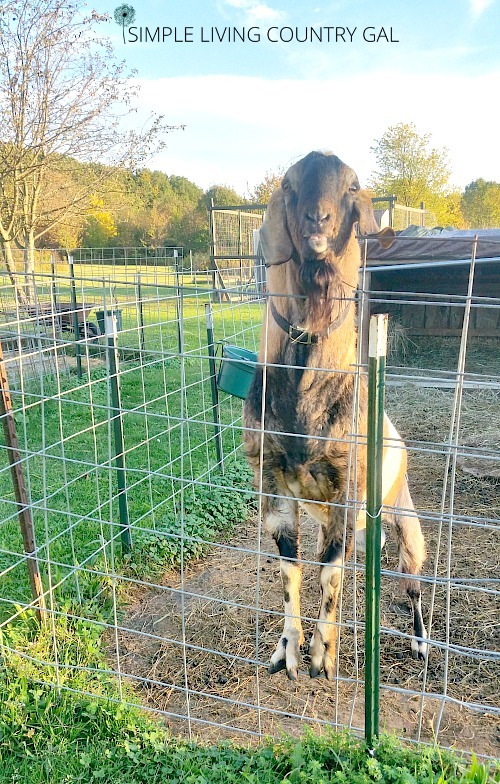 Now, I am not saying you shouldn’t buy a goat that was raised this way, but I am saying to buy them in the spring so they have plenty of time to get acclimated to a non-heated shelter before the temps drop. Since our bucks are outside year-round (except for breeding) they all have nice thick coats. They rarely shiver, except for first thing in the morning but after a nice breakfast they are soon fine and shiver free. The reason their coats are so thick is because they had time to develop. As the temperatures begin to drop goats will begin to grow their fur. The colder the weather gets, the thicker the fur. Lesson? 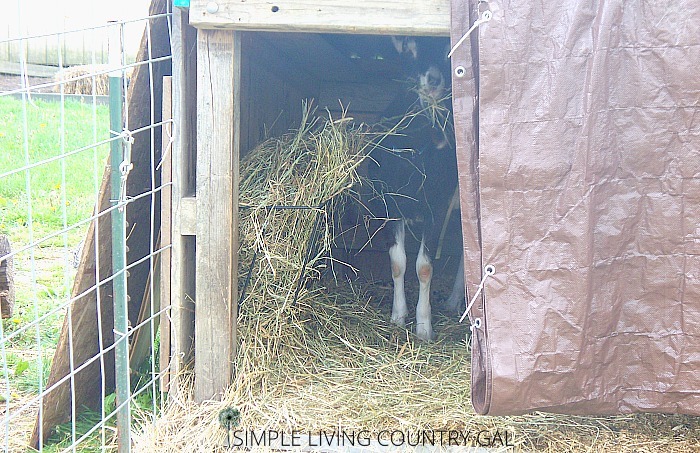 Put your goats out early so they have time to “harden up” and be better able to handle a cold winter with few issues. What all does a buck need to be housed? #1. A good sturdy shelter with room for them to get in and move around bit. You do not need a huge shelter, but they should be able to stand up inside of it and be fed and watered. This will keep them out of rain and snow unless they want to be. Also, make sure the shelter has at least 3 sides. #2. Place your shelter away from the wind. This was another lesson we learned really quick. Put your opening so it is facing out of the wind. For us that is facing north or east. Also, know you will have those crazy storms that blow the wrong way to have a plan B for those situations. For us our lean-to is deep enough that our buck can get out of the weather no matter what the wind wants to do. #3. 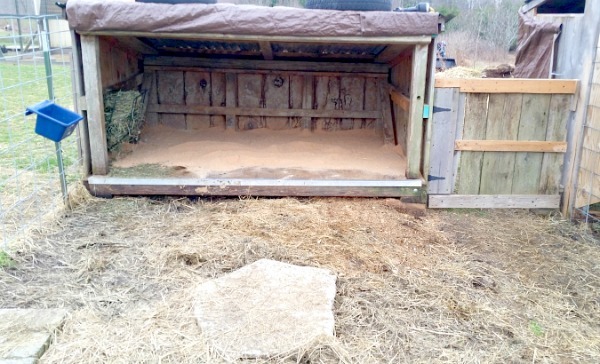 Have a way to feed hay, grain, minerals and water inside of the lean-to if possible. This just makes sure that everything is kept dry and moisture free. #4. Have a nice sized run. We have a pretty large for our buck that he has access to 24/7. This gives him plenty of room to walk around and strut if he feels the need. We also have a wooden spool for him to get up on and out of the mud or snow if the run is wet. #5. Add concrete or rocks. This one I feel is pretty important. Goat hooves are something that cannot be ignored even on smelly bucks. To keep things trimmed I have several old concrete slabs that I have in my buck’s run. I put them in upside down so the rough pebbly part is facing up. Goats do not like to be wet and they will prefer to walk on dry ground rather than wet. When my bucks walk on the concrete slaps they keep their hooves shaved down enough that I only need to trim things every few months rather than every month like I do my does. #6. Have adequate fencing. Like I said before our bucks are pretty well behaved. This is lucky for us and not something you can train into a buck. If they are born crazy, odds are they will remain crazy. So, know the mannerisms of your buck and house them accordingly. For us, cattle panels work just fine. These are 5-foot-high steel fencing that comes in long sheets. They are pretty easy to move, even for me and can be zip tied together to make a long sheet. We use green fence stakes (make sure they are heavy duty) that we drive into the ground to attach the panels too, again with zip ties. Tip: Put the stakes to the outside of the fence. Goats are very VERY curious and your buck will spend most of the day “standing” on the fence. (see image above, yes he does that all day long!) By having your stakes to the outside, you will give extra support to your big buck’s weight. Tip: I suggest walking your fencing line at least monthly so you are always aware of any weak issues that may come up. #7. Keep things dry. If your run gets really wet and you do not have concrete or rock to put in, then sawdust may be your only other option. 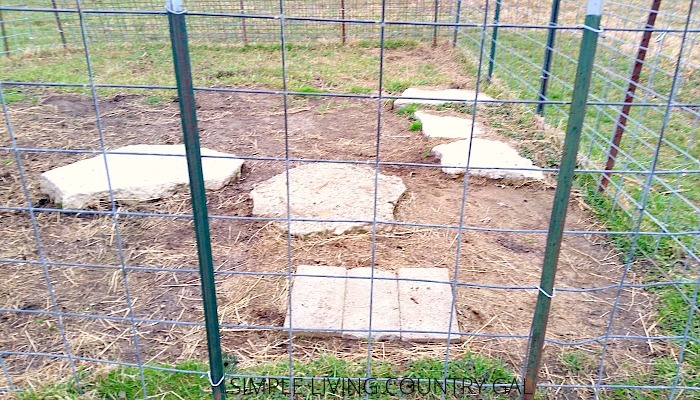 (do not use wood, it is very slippery when wet and you can easily hurt your goat) I will put down a nice layer in the fall when we prep for winter and add to it as needed throughout the winter. Please know if you add too much sawdust or wood chips to your ground you will deter drainage and cause a bigger issue. Make sure you have adequate draining before you begin adding anything. #8. Close it up in the dead of winter. Things can get pretty cold here in Northwester Pennsylvania. For that reason, I like to put a cover over the opening of our buck’s lean-to. I do this by screwing in a board or a heavy duty tarp that will cover ¾ of the opening. I will also put in a straw bale to get him up off the ground where it is much warmer. It is very important to make sure you have ventilation yet not a draft. A goats urine if full of ammonia and this is not good to breath in day and night. You will need the ventilation to keep the air fresh. Usually an opening at the roof of the shelter will give you the airflow you need. Warm them up when it’s really cold. I like to give my goat very warm water to drink when the temps are at their worst. He LOVES this water and is usually drinking it as I am pouring it. 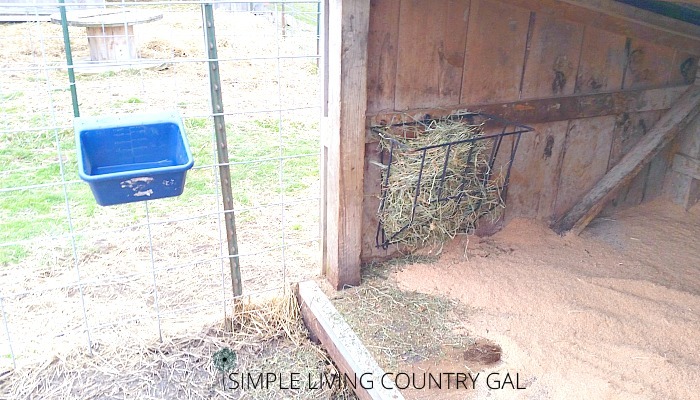 Also, the easiest way to warm up a goat quickly is with hay. As their rumen gets to work on the hay it acts like a furnace heating your goats right up. More often than not a little hay and warm water will take the shivers out in minutes. Above all things, trust your goat. They are pretty hardy if given a good clean shelter. As long as they have a thick coat and housing that is out of the wind and snow they will do just fine. If you are not sure of the comfort of a lean-to, crawl inside. I do this every year to make sure things are toasty and they really are. 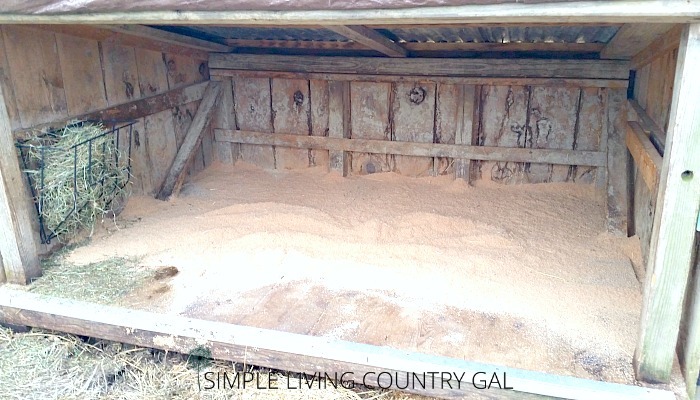 With their winter coat and the extra sawdust and bedding a lean-to can easily house your goats year round in any weather. When raising goats having everything on your homestead is convenient. If you have been nervous about housing a buck for your herd I hope you found some helpful tips and encouragement here. Above all things education is your best tool. Research, ask questions and visit other farms in your area. Seeing how others house their goats and bucks will be quite helpful. I was able to visit quite a few homesteads and I took the best from each to come up with my own layout. Try it and if it doesn’t work change it. There are no rules with goats, and they will be the first to tell you!! I do not breed fathers to daughters, but I have bred aunts to nephews if that makes any sense. I have heard that you “can” in breed goats with a smaller chance of issue but I have never given it a try. Instead, I keep two bucks so I am breeding further down the line. To be sure, I would contact a vet just to verify before breeding. sorry I am not of more help! I have bred a father to his daughter about 3 years in a row and have not had any problems. If I were you I would give it a try. So glad you found this post helpful. Keeping bucks can be tricky but as long as you put them in a safe and secure home you should be just fine!! I have 2 saanens that are 8 months old,very healthy, so you think I should wait until they are over a year old to breed? I have read and been told that even bottle raised bucks that have always been docile, can be dangerous during rut, I am in an area where I have not been able to find stud service when I do want to breed. Yes, Carolyn, even docile bucks become a bit aggressive during rut. I always keep my distance during that time just to be safe. Sturdy housing is the key to avoiding issues so make sure you have things in place before rut begins. With that being said, I have never been in any danger with my bucks. Being hands-on with them from day one is key to keeping things safer during rut. Even though 10 months is the recommended I prefer to wait until after a year to breed my gals. This is just what is comfortable for me. I know quite a few folks that breed at 10 months. If your does look strong and healthy you should be fine. Use your best judgment. 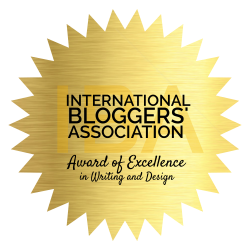 I loved your article! I have two does and a wether (Buddy). He is not nice to the girls at all! I found a very handsome buck that I would like but then what about Buddy? So now I feel ok about Buddy living with a new buck. Yes, Buddy can absolutely live with your buck, but be ready for some adjustment time. At first there will be some fighting and head butting and that is okay so don’t worry if you see that happening. Adjustment can be scary with animals, so just be patient and you will be fine! This was a fabulous post. Thank you! So glad it helped, Becky! Is a goat house also called a pen? I have two Nigerian Dwarf bucks who are brothers. Can i keep them in the same pen during rut or should we keep them in separate pens that are close together? Thanks! If they get along you should be just fine. I keep more than one buck in rut together and have not had problems, just be aware that they might be more rambunctious. If it were me I would keep them together.